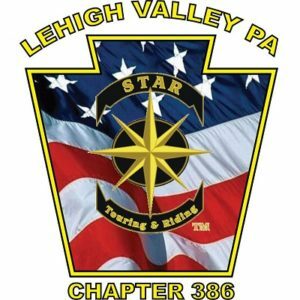 Lehigh Valley STAR Chapter 386 has released the 2019 Chapter Ride Schedule! Post-meeting rides will depart from the meeting location no earlier than 10:30am (typically Scott Powersports in Coopersburg, PA). Other rides will typically leave from the Wawa at 3300 Schoenersville Rd, Bethlehem, PA (across from the old Tri-City Powersports). All Chapter Rides are open to the public. Please note that the STAR Touring and Riding Association requires that all riders and passengers to sign a 2019 Ride Waiver to join Chapter rides. Also, guest riders must join STAR Touring and Riding Association after three (3) rides in a 5-month period in order to continue joining Chapter rides: you don’t have to join the Chapter, but you must be a member of STAR. Please see the Do I have to join STAR to ride with a Chapter question on the STAR FAQ regarding this requirement. The 2018 Chapter Ride Schedule is now available. Rally points and departure times are TBD: the Calendar will be kept up to date with these details. All Chapter Rides are open to the public. Please note that the STAR Touring and Riding Association requires that all riders and passengers to sign a 2018 Ride Waiver to join Chapter rides. Also, guest riders must join STAR Touring and Riding Association after three (3) rides in a 5-month period in order to continue joining Chapter rides: you don’t have to join the Chapter, but you must be a member of STAR. Please see the Do I have to join STAR to ride with a Chapter question on the STAR FAQ regarding this requirement. For those interested in getting in a ride tomorrow, Valley Forge Chapter #326‘s will having their first ride of 2018 on Saturday, April 14th. The ride will depart after their April chapter meeting and will head to French Creek State Park near Birdsboro. Ride departs at 11am from the VF Stars’ host dealership, Martin Moto, 567 RT100 North, Boyertown, PA 19512. Everyone is invited to attend their Chapter Meeting which starts at 9:30. If you plan to attend, please make your own way to Martin Moto. Since we’re sure everyone is overly stuffed from the Easter and Passover holidays, we’ve pushed April’s Bike Night back a week to Monday, April 9th. This month’s Bike Night will be at Mission BBQ on Grape St, in Whitehall. Arrive around 6:30 for some good food and conversation. Everyone is welcome. A great way for those interested in STAR to spend some time talking to our members to learn more about our group. With the new website design, all users must re-register for access to the Members Area. The secure area will contain items like our Meeting Minutes, a Member Directory, and other members-only information. Please have our STAR Touring & Riding Association membership card handy when registering in order to record your membership information as part of the registration process. Registrations will only be approved for active members of the Chapter. I hope you all like the new website–it has some more to be done, but this new system should prove to be easier to manage and maintain. Monthly Meeting of the Lehigh Valley PA Chapter of the STAR Touring & Riding Association. Visitors are always welcome. Michele Mski, LOS Rep from Pa-Exeter-Pa Chapter #529 has her 2000 V-Star 650 Custom up for sale. Reminder: Members who haven't logged in since March 2018 must register a new account.